Just a reminder, the HexChat schemes are "temporary", only the palettes and their color order were imported, I don't have much time to play with them at the moment and HexChat seems to have 16 colors + background (please correct me if I'm wrong here) which makes mIRC hard to copy the same themes. For anyone who has avoided using some of these themes due to lack of contrast for selected text in the editbox or selected nicks in the nicklist, that should not be a deal-breaker. The foreground/background colors for selected nicks, or selecting text in the editbox comes from the theme you defined in Windows' control-panel. This is also used for selected lines in menus or dialogs. It's possible to edit just that 1 setting in windows without changing your entire theme. Or, you could tweak the mirc theme to choose editbox and listbox colors which contrast against the selection colors. 3. 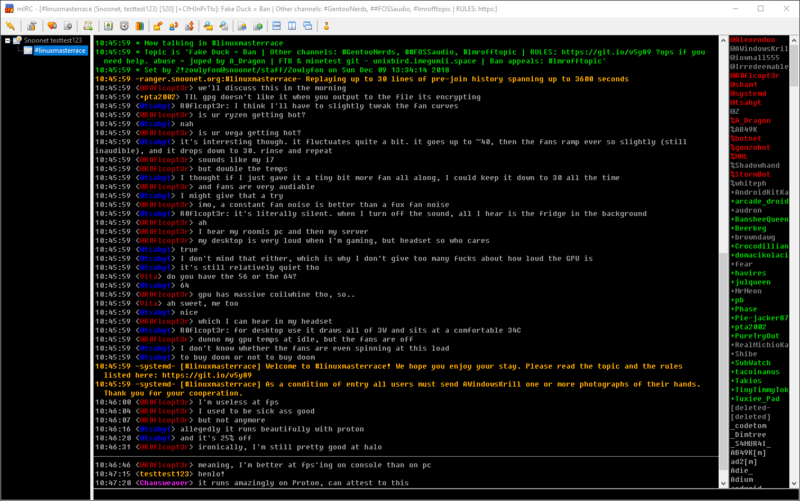 At the bottom of that area, click on "Window Color", which opens a dialog "Window Color and Appearance". 4. If you current theme is currently "unsaved theme", you'll either want to save the current theme to another name so you can return to it, or write down the current RGB colors before you change them. 5. In the 'item' dropdown, choose 'Selected Items'. 6. For now, let's avoid changing the font or the size, and notice the 2 squares labeled 'Color'. The top square is the background color and the bottom square is the text color. These control the text and background color for these selected items both here in mIRC and pretty much all Windows Apps. 7. You'll want to choose a background color that contrasts well against the foreground color you choose, but also contrasts well against the foreground/background colors you choose in the Alt+K dialog for the foreground/background colors in Editbox and Listbox. 8. When you click on either Color square, it opens a window showing a grid of 20 colors to choose from. If you don't like any of those shades, you can click 'Other' where you can create any RGB shade you wish. 9. When you click 'ok' or 'apply' the color setting is changed. It will then change your theme to be 'unsaved theme'. If you like it, you should click 'save theme' to give it a name. If you don't like this change, you could keep trying other color shades or just go back to your existing Control Panel Colors Theme prior to this change. It's not Wad's palette' standard anymore but "Wad's BlackGr2" is a little more readable IMO, the gray is a lighter. Adjusted the first blue on few shemes, added Dark background version of Monokai on all the Monokai schemes. A screen shot would be nice. That way we could see the theme without installing it first. Few may look the same but the palettes are slightly different. Would that be more convenient? Or build a dialog? It would be good! Are you asking me? I don't care about that at all or how people do it, I'm just having fun with colors, I barely use or used mIRC in the last 7-8 years anyway. It takes 2 seconds to copy all that and paste it in mirc.ini, this is all extra. Most of the screenshots are here: https://imgur.com/a/cHKyLCn, I still have to add the last five (Dracula and Zenburn). Not sure I modified anything else but Tempesta and Tempesta2 background is 2 points lower again, now 24,24,24 (identical to the Zenburn Darker themes), more readable this way. Khaled, you can remove all the previous posts if you'd like to. Thank you. Sorry guys, can't get enough of background darkness so I made a version of all the extra ones with the black background. Enjoy. Would you consider managing your color schemes by creating a repository for it, over at https://www.mircscripts.nl? No. At least not right now, you can copy it over if you want but this is all time wasting bs to me. I started with 3-4 of them just because I got tired I couldn't find anything else other than .mts themes online and schemes are just so easy to make. I don't even create a pastebin account with the same link because I don't care to manage that account. Khaled could give the permission to modify the first post or cleaning is just a small price to pay. Some updates in the Tempesta and the official Placid Hues, made a n2 on that one with a more readable yellow. Added Zenburn with white and light gray color for Normal and Own text.